Jackie Pop is a singer/songwriter from Brooklyn, NY whose high energy and heartfelt music have been setting stages a blaze for over eight years. She got her start playing guitar at the age of 16 and by the age of 18 self-released a full length with her first band Zinnia. Jackie moved to NYC after college where she further developed her music and style. Jackie Pop’s tone and song writing talent have best been compared to Jewel, Beth Hart, and Stevie Wonder. Her songs are warm, memorable, and full of pop perfection. Her lovely voice can make you laugh, cry and nearly everything in between. Her live performances are delightfully intense. 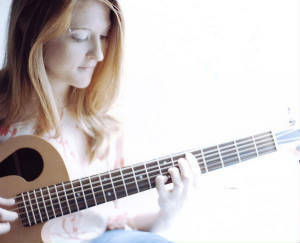 She has played with such musicians as Regina Spektor, The Butchies and Nicole Atkins. Jackie Pop currently plays solo acoustic shows all around NYC and leads the all female rock band Pop-a-roxi. She is self-releasing her first solo full length this fall entitled Pencils Down. On this album she explores a complex range of thoughts and ideas which are manifested into original pop tunes. Pencils Down will be promoted by a national tour in the fall.